Thanks to the motor-driven lifting through electro-hydraulic control unit fed by the mains available for the table, it is possible, even in the standard configuration, to easily and safely lift loads of up to 5000 Kg. In addition to the possibility of motorising lifting through electro-hydraulic control units, fed either by the mains or by through batteries, it is also possible to motorise electric traction, for long displacements or in order to facilitate movements in case of large or heavy platforms. 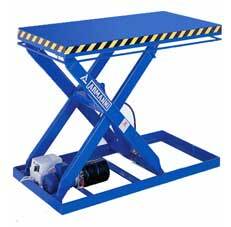 There is a large number of customisation possibilities, from the table measurements to the lifting capacity, up to the installation of specific accessories: eg table with rollers to facilitate the sliding of goods on the platform, boards to hold loads so as to execute movements under total safety conditions, rotating or connection tables for direct passage from the machines to the platform with minimum human input; efficiency and reduction of work times in total safety conditions at all times. Possibility of designing and manufacturing tables with platforms of large dimensions passable by lift trucks or cars with reinforced structures in order to ensure maximum capacities and with double pantograph structures for more elevated lifting operations. The complete safety equipment includes micro limit switch and perimeter safety micro switches.